Ensure you own one of the following devices. Amazon no longer sells the Fire Stick with it’s original remote. You can now only but it with the Alexa Voice Remote, which works great with Kodi anyway! If you’re looking for something with more power than the Fire Stick, try Amazon’s Fire TV Box. In this guide, we’ll show you how to install Kodi on an Amazon Fire Stick. We’ll keep this guide as simple to follow as possible. If you have any problems, don’t hesitate to let us know below in the comments. We can usually get back to you within 30 minutes unless we’re sleeping! Installing Kodi on the Fire Stick is a pretty simple task, and only takes a few minutes. To start, head to the Kodi website, specifically the Download page. Scroll down and choose android. A window will pop up, choose ARMV7A (32 Bit). 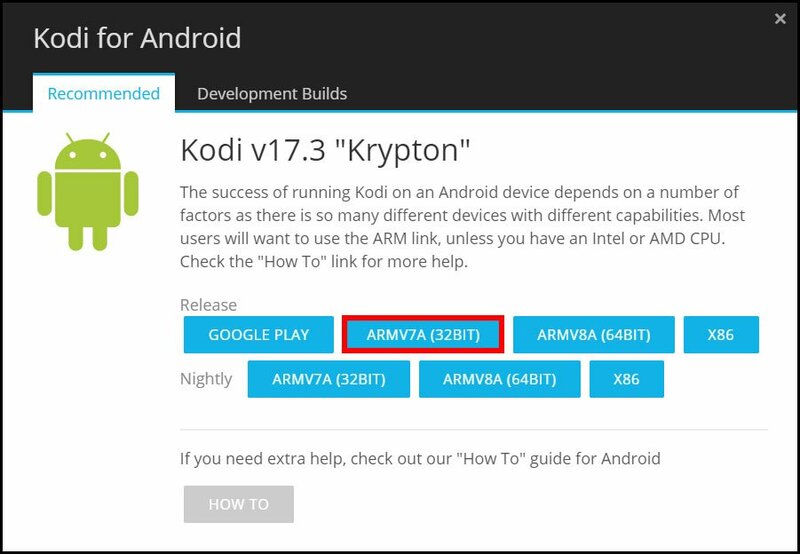 The APK File will start downloading. It’s between 75MB and 100MB. Make sure you know where it’s downloaded too as we’ll need it in a minute. It will usually just end up in your “Downloads” folder. So now that we have the Kodi application file ready to be installed, we need a tool to install it to the Amazon Fire Stick. We’ll be using adbLink in this guide. Head over to the adbLink site and download the program. Direct link is also available here for Windows. Go through the installation process and choose a directory to install it to. I usually just let it install to my C:\ Drive. Now that it’s installed, run adbLink, by either running the program from the location you installed it too, or checking the “Run adbLink” Checkbox at the end of the installation. Open the Home menu on your Amazon Fire Stick and ensure you’ve got it connected to the same network as what adbLink is running on. You can connect your Amazon Fire Stick to the internet by heading into Settings and then open Network. On the Fire Stick, head into Settings > Device > About > Network. On the right you’ll see all of the information for your Fire Stick regarding it’s network connection. Look for IP Address, and note it down. Leave the Amazon Fire Stick on the Home Screen and head back to adbLink on your computer. With the adbLink Program open, press the “New” button, which should be located below a text box. In the Description box, just type a name such as Kodi stick. Now in the address, enter the IP Address that you got before from the Fire Stick and press Save. Now that’s done, you’ll be back on the main menu for adbLink. There is a dropdown menu under “Select Device”, choose the Device we just added. It will be named after the description you chose. Now hit “Connect”. You should see the device enter the “Connected Devices” box in the top left. All we do now is press the “Install APK” button, and browse to the location where we saved the Kodi .APK file previously. Select it, and adbLink will begin installing it. 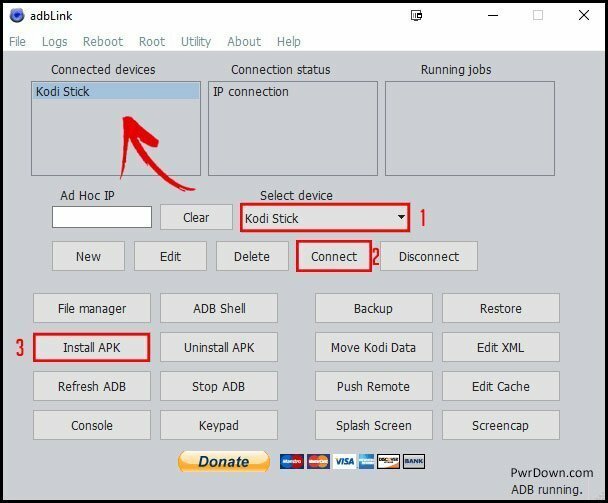 Make sure your Fire Stick stays powered on whilst adbLink installs Kodi. You will have a progress bar in the bottom right which you can refer to. It can take 10 minutes upwards to install it, however once it’s done you’ll get a notification. All you have to do now is go to your Amazon Fire Stick’s home screen, and you’ll see Kodi in the list of apps. Just run it to do it’s first time setup, and that’s it. Congratulations, you’ve just installed Kodi on an Amazon Fire Stick! Take your Kodi setup further by using custom Kodi builds and installing various add-ons. 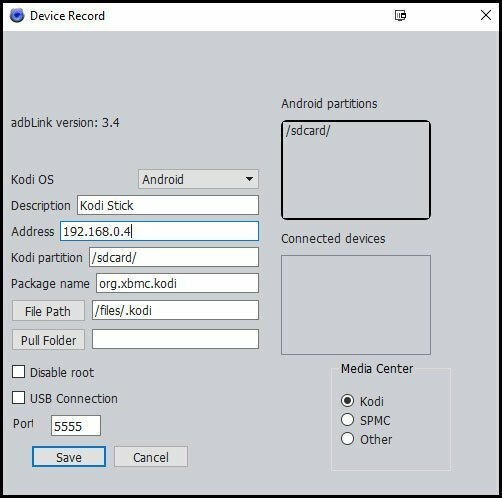 Can I just install the KODI by transferring it directly from my computer to the fire TV stick? Is it safe on my computer to use the stick directly rather than through adbLink?